CROWD SOURCING Anna Jean Bennett – Can You Help? When I started the genealogy blog, started going to genealogy meetings, and became more involved with genealogy social networks, I think what I was truly looking for was discussion. I wanted to connect with people researching similar problems and get advice, and perhaps offer it sometimes. I was recently inspired by Randy Seaver’s crowd-sourcing of a family history problem he’s been tracing for years. So I’m crowd sourcing some ideas and info on Anna Jean (Bennett) Douglas. I don’t have one percent of Randy’s readership, but I am hoping that a reader might know something about Montreal records, Boston records, Bennetts, or have some magic pixie dust to sprinkle on this. 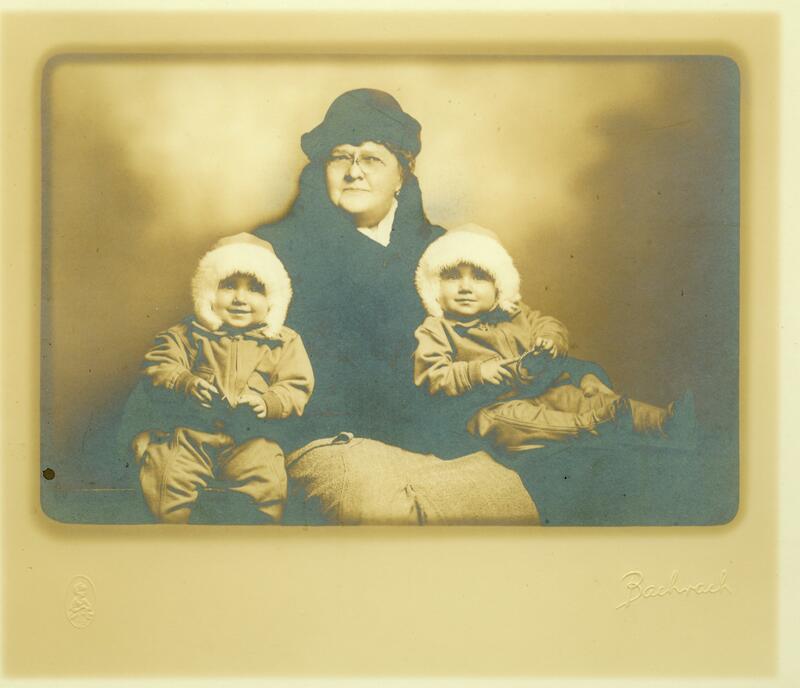 Aunt Jennie with great-nieces around 1932 – my mom Pat and her twin, Ann. The early years of Aunt Jennie’s life are a mystery, up until her marriage to William W. Douglas in 1884. I have very little to go on. The details of her early life are interesting to me because Aunt Jennie’s mother is my gg-grandmother Catherine Yonge (Bennett) (Baldwin) Ross from Surrey, England. Knowing more about Jennie’s early life is bound to reveal more about Catherine’s. She usually reported her birth date as 16 July 1853 or 1854 in either Belmont, NY or Rochester, NY. No contemporary record found. 1860 Federal Census, Amity (now Belmont), Allegany County, New York, she is living with mother Catherine and stepfather Edward Baldwin (“Ed Baldin”, “Cate”), plus young sister Hattie. 1873 Marriage #1 to Harrison Gilley, Sterling, Mass. Jennie’s mother lived in Sterling with new husband #3, Hiram Ross. Harrison Gilley was a Boston druggist and Civil War vet. Record on FamilySearch.org. 1884 Marriage #2 to William Wilberforce Douglas, a Providence attorney, in Newton, Mass, where Jennie’s mother and stepfather Catherine and Hiram Ross were now living. Second marriage for her, first for him. Record on FamilySearch.org. She is listed as “Ann Jean Bennett”, not Gilley. 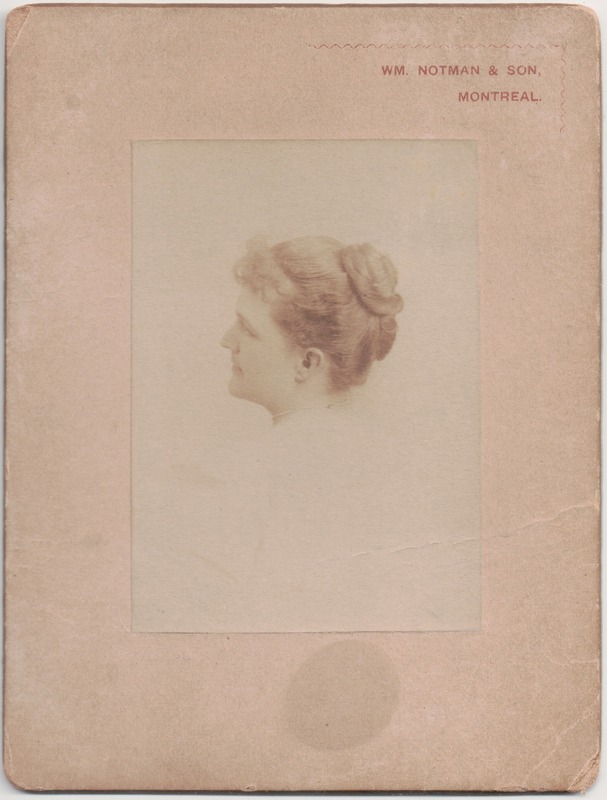 An early undated picture of Aunt Jennie has a “Montreal” mark. Why would she be in Montreal? Were her father and brother (both named William Bennett) there? Or could it be a picture taken while traveling? AFTER 1884, no more mystery; we know a lot about the rest of her life, because my mom knew her. Aunt Jennie was a loyal friend to all her nieces and nephews and their families. She and her husband traveled extensively. I believe my grandfather was a favorite; mom has many mementos of Aunt Jennie’s life and travels. 1900 Federal Census, Providence, R.I. Living with husband W.W. Douglas; they never had any children. 1930 Federal Census, Washington, DC. A widow in an apartment in DC. She later returned to Providence. 19 Aug 1939. Death in Providence. My mom remembers how sad it was to pay the last visit to her apartment, shortly before Aunt Jennie’s death. Buried at Swan Point Cemetery, Providence. I have her Probate records from the Providence City Hall. 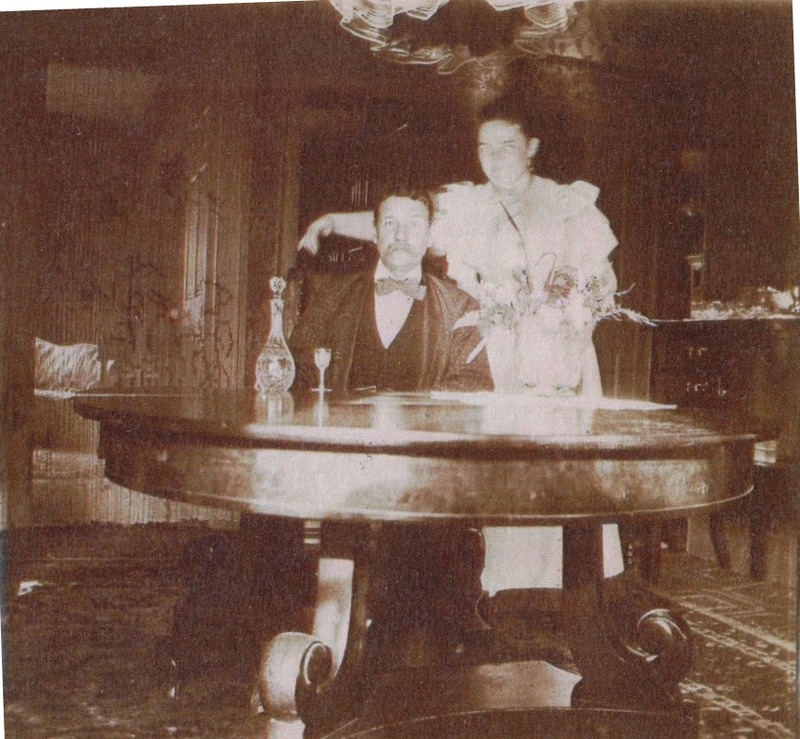 Anna Jean and husband, Judge Douglas, at their home at 121 George Street, Providence, early in their marriage. Where was Anna Jean in 1865? not in the NY state census for Amity. In 1870? She was not living in Sterling, Mass. with her mother, the newly remarried Catherine Ross (wife of Hiram). In 1880? Since I also have very little trace of her brother, artist William Blackstone Bennett during these years, she may have been with him and her father. Her father is named either Thomas or William T. Bennett. Who is he? I have found him only once – Aunt Jennie’s brother William married in 1890 in Digby, Nova Scotia and gave his father’s info as William Bennett, builder and stated his own place of birth was Rochester, NY. The 1890 Rochester City Directory does list a William Bennett, Carpenter, b. r. 448 North av. But no other Rochester City Directory has a William Bennett that seems to be a builder or carpenter. He may have been in a different location entirely by then. But something about that Nova Scotia record (plus the fact that Anna Jean and her brother were not always with their mom) suggests to me that William Bennett Sr was still living in 1890. How did she meet and marry Harry Gilley from Boston in 1873? How long did they stay married? where and when did they divorce? How did she meet her second husband William W. Douglas, who spent his life in Providence? I know quite a bit about his family and professional history, but it doesn’t give me any clues. I love this picture. She has the dog (Dinah) dancing on the dining room table! The quality of the last two snapshots is not good; I suspect Uncle Will bought a camera for home use when they were first available – could that have been in the late 1880’s? My mother remembers Aunt Jennie when she was quite old, and the thing she is most sure about is that her father cared very much about Aunt Jennie. Just based on the pictures here, she looks like someone you would want to meet. I love how proud she was of my beautiful mom and her sister. 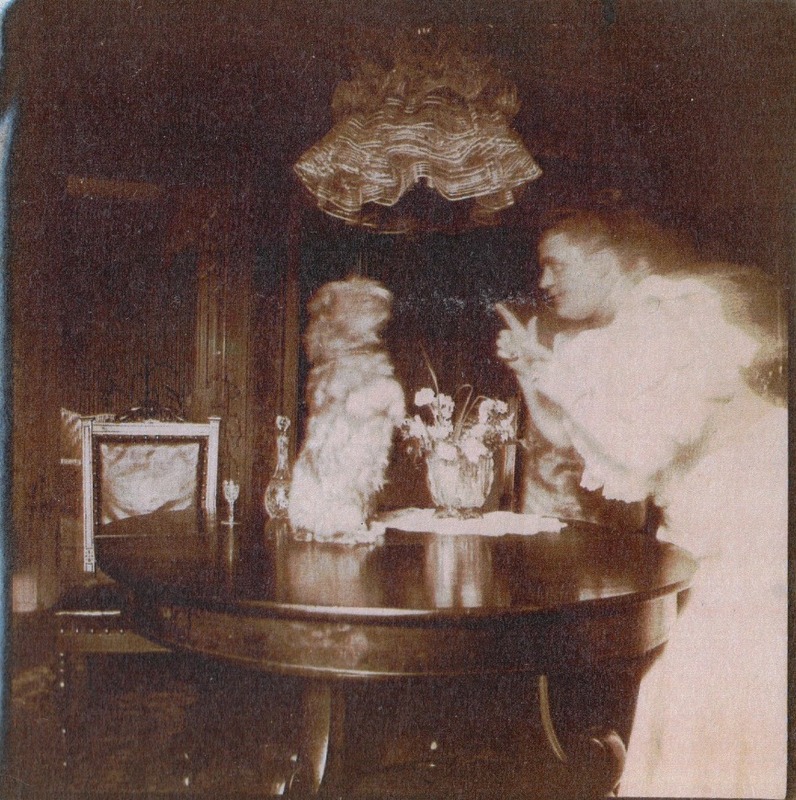 I love how her husband was willing to snap photos of the dancing dog – probably quite expensive in those days! explore Boston City Directories for first husband Harrison Gilley’s whereabouts each year. He was in the 1870 U.S. Census in Boston, living with his family. His 1891 Civil War pension application indicates he is divorced. He died (“Harry Gilley”) at the Consumptive Hospital in Boston 25 Jun 1892. The city directories may indicate how long the marriage lasted. The other idea is to seek the divorce record of Anna Jean and Harrison Gilley. “New England Court Records: A Research Guide for Genealogists and Historians” by Diane Rapaport (Burlington, Mass., Quill Pen Press: 2006) suggests that divorce records from this time period will be in the archives of the Massachusetts Supreme Judicial Court in Boston. She suggests contacting them for information on locating a specific record. I sent an email tonight, I hope they can help me. If anyone has any better ideas, or can find anything, let me know! There might not necessarily be a Canadian connection. Early portrait studios often sent out reps and salesmen. I will be in Montreal the Nov 28-Dec 1. I will see if I can get access to the librarian who oversees the Norton Collection. The McCord is a museum I have wanted to visit so now I have a reason! William Notman Studio opened in 1858, but it looks like the W.M. Notman and Son Studio opened in 1882 when his son, William McFarlane Notman joined and the stuido changed it’s name. He also opened studios in Boston and numerous others in New England. Perhaps she also had photos taken in the US at one of his other studios? Ref: http://www.getty.edu/vow/ULANFullDisplay?find=&role=&nation=&subjectid=500033451. I also found references for WM Notman Studio as late as 1917. In addition to Randy’s suggestions, I suggest you visit the Notman Photographic Archives Collection in regards to the photo Wm Notman & Son Montreal. Susan, thank you for that. The McCord site is a fabulous resource. I’ve explored it before, but I know a little more now, and I’m going to go through it all over again. Thank you all for any Canadian resources, I really need them! Connie, I have thought of that. With that in mind, I may give a try to some specific schools or their locations. I, too love Genealogy Bank. This all suffers from the name William Bennett being reasonably common. But perhaps I haven’t pursued that enough. thanks! Thanks, Lisa. I was familiar with Fulton, not so much the others. That Cornell site gives an interesting guide to NY newspapers online – thanks!! I find your Jennie’s story fascinating. I think since Catherine is English that she probably immigrated to Canada. Check the Anglican church records for marriages, baptisms, etc.. Guess I would start with Rochester, NY. Randy – so I recently went to a domestic Ancestry subscription, so I’ll look around for access to the Montreal census records. William Bennett – sigh – is always difficult. I have some much later passport records for Anna Jean, but never thought of seeking out EARLIER ones – interesting! And I agree I think attacking the newspapers again is a good idea. Now that I really think about it, I’m not positive I’ve found a real newspaper article about her marriage to W.W. Douglas. I may try that at the RI Historical Society soon. Don’t know if you have the news item for the death of Harrison Gilley. That’s a unique name, so I looked him up. I realize it’s not one of your questions…. Unfortunately, no mention of his marriage. GILLEY — In this city June 25 Harrison Gilley son of the late Capt. John Gilley of Marblehead, 51 years. Dawn – yes I do have that death notice. He died young, but based on his 1891 pension application, had wasted away and was chronically ill by then. I agree, Harrison Gilley is a delightfully uncommon name! I love crowd-sourcing for solutions! Who knows where your bait will lead. You’ve done a lot of work here and have quite a bit of information. I’m struggling with an elusive female ancestor too, and I have had some success working with her F-A-N Club. A few ideas: You found the marriage records and have the dates; could there be newspaper articles reporting the wedding? Were they a prominent family? You might get more details there. Also, the parents obituaries may give the survivor’s names which are likely to include husband’s names for daughters. I will try to help you spread the word. Good luck! Hi Denise. In other cases, I love the FAN Club but in this case it’s much tougher. I have traced each of her three siblings extensively, but it hasn’t led to much. Love the idea about the newspapers, I have only taken a couple of shots at that, I should try more. Jennie’s mom died in 1907 but I have not yet found an obit for her. But thinking about newspapers, I could check back in the mom’s home town. thanks! Since you have some clues about Jennie that indicate there may be a Canadian connection – I suggest you check Canadian vital and census records for Jennie (all name variations), her brother and her father. There may be passenger list records for any of them also, and border crossing records (both ways to/from Canada). There may be a passport record (American or Canadian) for any of them. Perhaps Lorine Schulze has better suggestions for Canadian records. There may be newspaper records for the New England years until 1884 – check Ancestry, GenealogyBank, Chronicling America, etc.